Yu-Gi-Oh! 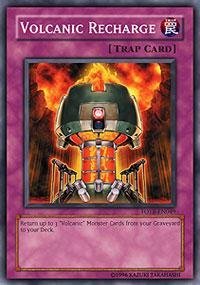 is a strategic trading card game in two players Duel each other using a variety of Monster, Spell, and Trap Cards to defeat their opponent's monsters and be the first to drop the other's Life Points to 0.Card Name: Volcanic RechargeCard Type: Normal TrapCard Number: FOTB-EN049Set: Force of the BreakerAttribute: TrapPasscode: 33725271Card Text: Return up to 3 'Volcanic' Monster Cards from your Graveyard to you Deck. Yu-Gi-Oh! is a strategic trading card game in two players Duel each other using a variety of Monster, Spell, and Trap Cards to defeat their opponent's monsters and be the first to drop the other's Life Points to 0.Card Name: Volcanic ScattershotCard Type: Effect MonsterCard Number: FOTB-EN010Set: Force of the BreakerAttack/Defense: 500/0Attribute: FireLevel: 2Monster Type: PyroPasscode: 69750546Card Text: When this card is sent to the Graveyard, inflict 500 damage to your opponent. 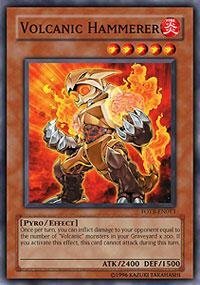 If this card is sent to the Graveyard for the effect of a 'Blaze Accelerator' card, you can send 2 'Volcanic Scattershots' from your hand / Deck to the Graveyard to destroy all monsters your opponent controls. Yu-Gi-Oh! 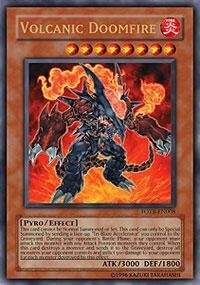 is a strategic trading card game in which two players Duel each other using a variety of Monster, Spell, and Trap Cards to defeat their opponent's monsters and be the first to drop the other's Life Points to 0.Card Name: Volcanic CounterCard Type: Effect MonsterCard Number: SDOK-EN014Set: Structure Deck: Onslaught of the Fire KingsAttack/Defense: 300/1300Attribute: FireLevel: 3Monster Type: PyroPasscode: 66436257Card Text: When you take battle damage while this card is in your Graveyard: Banish it from your Graveyard, then if there is a FIRE monster other than "Volcanic Counter" in your Graveyard, inflict damage to your opponent equal to the amount of battle damage you took. Yu-Gi-Oh! is a strategic trading card game in two players Duel each other using a variety of Monster, Spell, and Trap Cards to defeat their opponent's monsters and be the first to drop the other's Life Points to 0.Card Name: Volcanic DoomfireCard Type: Effect MonsterCard Number: FOTB-EN008Set: Force of the BreakerAttack/Defense: 3000/1800Attribute: FireLevel: 8Monster Type: PyroPasscode: 32543380Card Text: This card cannot be Normal Summoned or Set. 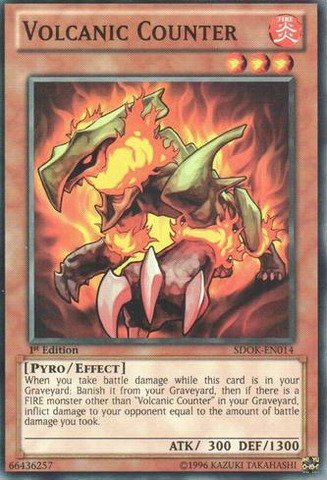 This card can only be Special Summoned by sending 1 face-up 'Tri-Blaze Accelerator' you control to the Graveyard. During your opponent's Battle Phase, your opponent must attack this monster with any Attack Position monsters they control. 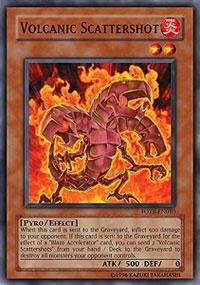 When this card destroys a monster and sends it to the Graveyard, destroy all monsters your opponent controls and inflict 500 damage to your opponent for each monster destroyed by this effect. Yu-Gi-Oh! is a strategic trading card game in two players Duel each other using a variety of Monster, Spell, and Trap Cards to defeat their opponent's monsters and be the first to drop the other's Life Points to 0.Card Name: Volcanic HammererCard Type: Effect MonsterCard Number: FOTB-EN013Set: Force of the BreakerAttack/Defense: 2400/1500Attribute: FireLevel: 5Monster Type: PyroPasscode: 54514594Card Text: Once Per turn, you can inflict damage to your opponent equal to the number of 'Volcanic' monsters in your Graveyard x 200. If you activate this effect, this card cannot attack during this turn. Yu-Gi-Oh! 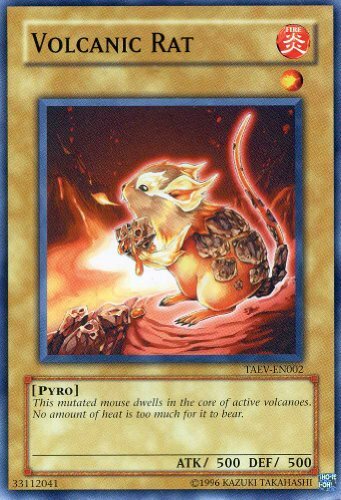 is a strategic trading card game in two players Duel each other using a variety of Monster, Spell, and Trap Cards to defeat their opponent's monsters and be the first to drop the other's Life Points to 0.Card Name: Volcanic RatCard Type: Normal MonsterCard Number: TAEV-EN002Set: Tactical EvolutionAttack/Defense: 500/500Attribute: FireLevel: 1Monster Type: PyroPasscode: 33112041Card Text: This mutated mouse dwells in the core of active volcanoes. No amount of heat is too much for it to bear.